Things you need to know about carbohydrate foods to move forward with your whole grain diet eating foods with carbs while still being able to maintain your weight. Here's a carbohydrate foods list to add to your cart the next time you go shopping. Carbohydrate foods can make or break your chances to lose weight. In fact most of what you hear about foods with carbs tends to leave you with mixed feelings. 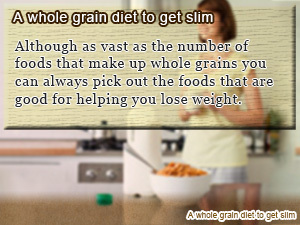 On the bright side of things, there is still hope of succeeding in weight loss just by eating healthy on a whole grain diet. What are some good carbohydrate foods that support a whole grain diet? Foods with carbs make up a vast majority of the food you eat including whole grains such as rice, wheat grains, and potatoes. These Carbohydrate Foods make up what is called the whole grain diet that you don't want to miss out on especially if you need to lose weight eating right. Eating carbohydrates with known low glycemic index values are what help reduce doubt that carbs won't make you fat. As the primary source of energy for your body putting the best low-gi foods with carbs in your body can be an irreplaceable part of your diet promoting healthy weight loss. 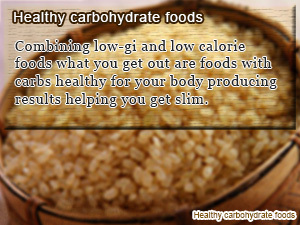 In this daily roundup of Slism, we bring together the some carbohydrate foods that are worth thinking about adding to your whole grain diet for eating foods with carbs without gaining weight. When rice is your staple food the calories in your food start to add up bubbling to the surface in unsightly places throughout your body possibly becoming the muffin top part of your body that you're going to wish goes away before summer starts. Eat brown rice over white rice and save big in calorie consumption while improving your daily nutrition to support healthy weight loss. Some even say that brown rice is the contemporary of wheat bread because of the fact that it is known to have more than twice the nutritional value of white rice with the same amount of calories. 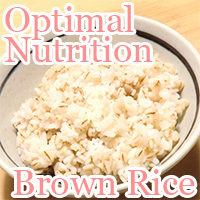 Due to the fact that brown rice contains substantially more dietary fiber than white rice it forces you to chew more. As you know there are many benefits of chewing your food that can be taking advantage of giving the opportunity. That's where brown rice just works. Not only does it help with indigestion but helps control your appetite. What first comes to mind when your think about diet is the lack of freedom you have when it comes to selecting the foods you eat due to strict calorie restrictions. How good would it feel to be able to start dieting without having to feel like you have to feed yourself from a stick? Break out from your chains on The Okayu Diet. Eating rice porridge over rice helps you cut your calories in half while effectively raising your core body temperature like drinking a hot steaming cup of green tea. Whether you are looking for an ingenious way to cut back on calories in your diet are a midnight snack Japanese rice porridge is the way to go not to mention so easy to prepare. 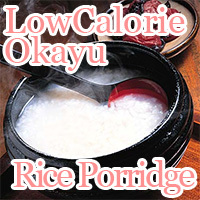 In addition to containing 100 less calories per bowl of rice, okayu rice porridge helps you boost your metabolism while providing you with something easy to digest that is full of nutrition when you are feeling under the weather, and most importantly helps you diversify your meals without increase the amount of food your eat. Better yet, incorporating rice bran into your daily meals is simple and easy. Due to the fact that it is low in calories you don't have to worry about going overboard no matter how much you want to use. It's good for your skin not to mention helps prevent compulsive overeating and even ease constipation. 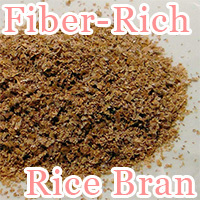 Rice bran does wonders for re-vitalizing the surface of your skin. By either adding it to your food or drinking it directly in a rice bran drink you can get all the benefits of rice bran without having to pay an arm and a leg for rice bran oil. While you are out there looking for new and improved ways to spice up your eating, The Cereal Diet gets left behind no matter how balanced the nutrition. In fact, there is a reason besides being easier to prepare and not costing any energy that people eat cereal for breakfast and that is that is really good for you. Some cereals have been proven to have the probiotic effect similar to yogurt on your body improving the gut flora health in your digestive tract increasing the number of good bacteria on your side aiding in nutrient absorption for better health. With so many different flavors to choose from you can never run out of ideas to get more fiber in your diet. All you need to do is turn a meal or two that you would otherwise be eating a burrito are sausage muffin sandwich with a healthy build of cereal. 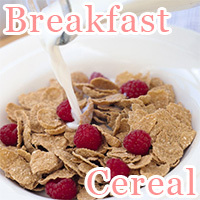 This can include eating a bowl of cereal with milk poured over it for breakfast cutting back on calories without having to compromise when it comes to balancing nutrition in your diet. One reason why people over eat is because that how people react to the guilt of eating what you aren't supposed to. Well, on the Soba Diet there is no reason to feel ashamed because you are what you eat and you don't need to be guilty. 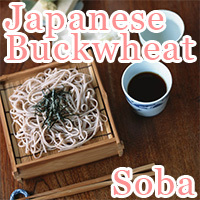 Japanese buckwheat noodles to say the least are good for you an may be just what you need to pick your diet up. Pick a meal, any meal on a day you don't know what to eat and eat a plateful of soba noodles stepping away feeling better about yourself not to mention full of energy ready to take on the world. Soba noodles have long been considered a super food in terms of reducing calories without getting rid of nutrition. Soba gives you lutein that is said to help prevent diseases from ruining your lifestyle later in life and in particular is a good source of polyphenol, an antioxidant that comes with many amazing benefits you are going to want to keep such as improved circulation and antiaging agents that keep you looking young longer. There is a reason why people flock around the Japanese Sweet Potato Diet. Although it is not that well known, the Satsuma-Imo as it is called in Japanese is one of those low calorie healthy carbohydrate foods that you need to keep your eye out for when you are shopping for groceries at the supermarket. So next time you are out ask your local grocer if they carry Satsumaimo. Going on a diet with Japanese sweet potatoes is easy. 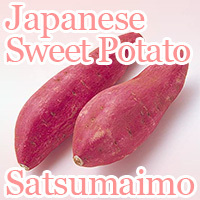 The only thing you need to remember is to eat one Satsumaimo in replacement of your regular meal. Not only does this help you greatly lower you calorie intake leaving room to indulge a little afterward if you are up for it but also gives you Dietary Fiber to remedy constipation issues away and Vitamin C for better looking skin to keep you looking young and full of vitality. Just when you thought eating too much carbs is going to make you fat, it turns out there is a solution that might as well be eating healthy Japanese sweet potatoes for lunch or dinner helping you keep your calories down without starving yourself giving you hope of succeeding in your diet without having to make too many compromised always feeling in charge. Not all carbohydrate foods have to taste like a cardboard box. Take a break from strict eating requirement taking a bite into a warm Azuki red bean past bun that is commonly known as Anpan in Japanese. Although a food with carbs it comes with relatively low calories making an excellent meal replacement on days when you feel you've had enough with real comfort eating. Don't let comfort eating drive you. Eating healthy Anpan not only makes a great substitute but when combined with vegetables or a soup and salad you have one of the best ways to eat right with balanced nutrition still being able to satisfy your sugar tooth in the process. The Anpan diet is not to be underestimated if you know what's good for your body. Prevent overeating putting a stop on harmful binge eating that could ruin your diet keeping it under 300 calories. Not only does this hit the spot in your stomach holding you down until your next meal but is guilt free. If you are looking for a pick me up when you need it you would be crazy not to give red bean buns a try for your diet and let it rest. One thing topic that often comes up when discussing carbohydrate foods is which contains more calories bread or rice. Although all foods with carbs may be treated the same only looking at carbohydrates, when you take a look at how much calories are in your food the difference becomes more easy to see. Even if you are not ready to make rice your staple food it is always worth it to take your time to compare bread against rice to attain a better grasp on which diet is right for you before cutting the option out altogether. 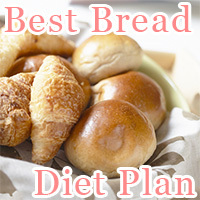 Although bread eaters get picked on for eating too much calories in their diets, what you will find out that is that it isn't as bad as rice buffs make it seem. Take a look at a list of bread calories to find out which bread actually has the least amount of calories so you can make more informed decisions at the grocery store balancing out calories against nutritional value for the best possible combination in your diet to turn healthy eating into a part of your diet consciousness. Combining low-gi and low calorie foods what you get out are foods with carbs healthy for your body producing results helping you get slim. Although as vast as the number of foods that make up whole grains you can always pick out the foods that are good for helping you lose weight. 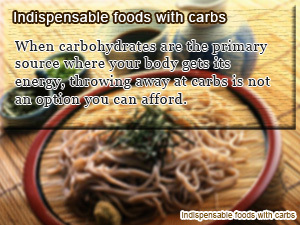 When carbohydrates are the primary source where your body gets its energy, throwing away at carbs is not an option you can afford.